An eclectic mix of small manufacturers, shopkeepers and service providers dominated the streetscape of towns across the north-west of England during the late Georgian era. Today shop-workers usually commute into town centres to sell goods produced elsewhere, whilst the buildings in which they work tend to house offices above the ground and first floor levels. But in the late eighteenth and early nineteenth centuries, these buildings were generally inhabited day and night by individuals who both lived and worked in them, and who constituted anything from 20-60% of the urban population. Our view of the commercial world in this period tends to be dominated by narratives of particularly big and successful businesses, and those involved in new and large-scale modes of production. Yet in places such as Manchester, Liverpool, Preston, Bolton, Salford, Blackburn, Warrington, and Wigan, which are the settings of my current research, it was not great factories and mills that altered the urban and economic landscape – at least not before the 1820s – but rather the proliferation of small businesses. As Maxine Berg has argued, the transformation of towns and regions in the early industrial revolution in Britain was achieved ‘on the backs of a myriad of smaller and medium-scale producers, and not on the spectacular but isolated successes of small numbers of giant industrialists and financial elites’. [i] Moreover, as historians of consumption – including Berg – have explained, it was not only producers that promoted growth during the long eighteenth century, but also consumers, who bought goods from an increasing army of retailers, many of whom also contributed to the supply chain, by being involved in the manufacture of the goods that they stocked. Notions of social class in the fast changing commercial landscapes of these towns were particularly slippery, and whilst hierarchies certainly existed in these societies, and were keenly regarded and extremely important to contemporaries, they can be difficult for historians to categorize. The complexity of social structure, and the fine gradations of status that constituted British society during the long eighteenth century, has been noted for many years. Though the very richest and most powerful members of the social elite, as well as those who were poorest and had least control over their destinies, seem relatively easy to identify, individuals who were positioned in-between are much harder to classify. One part of this section of society, the ‘middling sorts’, has particularly interested historians of the eighteenth century, and the size, wealth, culture and politics of the urban middle classes have all been subjected to scrutiny by scholars keen to map the fortunes of the ‘polite and commercial people’ of the eighteenth century, as well as tracing the emergence of the assertive bourgeoisie of the nineteenth. However, it seems likely that the middling sorts of the long eighteenth century (and indeed thereafter) constituted neither a unified nor a stable social group. The majority of tradesmen and women who form the basis of my current research could be defined as a subset of the middle class(es) – the ‘petit bourgeoisie’ or lower middle class – with the addition or inclusion of skilled artisans, which in the past some historians have termed the ‘labour aristocracy’, and also taking in rather wealthy members of the middle, or even upper middle classes, consisting of those who had been particularly successful in business. But to describe them thus appears to shoehorn these men and women into categories that have far more meaning for modern historians than they would have had for those at the time. Instead, it seems more useful to describe our subjects in a way which would have made sense both to the individuals concerned, and to their contemporaries: namely as being traders, by which is meant the buyers and sellers of goods, those involved in small-scale manufacturing or skilled handicrafts, and the providers of allied services. Though ‘trade’ was used very broadly for much of the seventeenth and eighteenth centuries to describe any occupation, business or profession, by the late eighteenth century, a distinction is apparent between those who traded merchandise overseas on a grand scale, who were called merchants, and those whose efforts were more modest, and generally involved selling to individual domestic customers, who were termed traders or tradesmen (and women). From around 1750, authors of a variety of publications aimed at helping individuals negotiate day-to-day issues of business and commerce were clear in their understanding of ‘tradesmen’ as a recognisable group that was distinct from ‘gentlemen’ and ‘merchants’, as well as being far more numerous. Early on in the eighteenth century, Daniel Defoe differentiated between retailers (whom he described as ‘tradesmen’ or ‘tradingmen’) and small manufacturers (whom he termed ‘manufacturers’, ‘artists’ or ‘handicraftmen’). [ii] Though his definitions continued to be reproduced in a handful of works later on in the century, most publications tended to conflate these different meanings into the single term of tradesmen from the mid century onwards. Thus Catherine Kearsley’s Gentleman and Tradesman’s Pocket Ledger, for the year 1795, includes a section on ‘secrets in arts and trades’, some of which are specifically aimed at manufacturers. In the satirical Tradesman’s Looking-Glass from around 1785, a meeting of ‘poor tradesmen’ is described as being largely composed of small manufacturers, including ‘Crispin the shoemaker, Trim the taylor, Grim the Blacksmith, Glue the Joiner, Chip the Carpenter, Laystone the Mason, Pick-quarrel the Glazier, Hemp the Ropemaker, Lath the Tiler, Thum-it the Tinker, Lanck-wool the Serge-maker, Hanging Arse the Weaver, Greasy the Comber, Turn-round the spinner, Mend-all the Cobbler, Bloody the Butcher, Pinch-load the Baker, and Grind-all the Miller’. Similarly, Hannah More’s The Apprentice Turned Master, published in 1796, described how James Stock, the ‘faithful apprentice’ of Williams, the idle shoemaker, became a ‘creditable tradesman’ after being allowed to set up in business as a shoemaker himself by his ex-master’s creditors: ‘such is the power of a good character’. Those involved in manufacturing seem to have been typically described as traders, despite Defoe’s injunction that the term should be limited to shopkeepers who did not make their own wares. His definition of merchants, however, as a degree of people above traders, ‘who import the goods and growth of other countries, and export the growth and manufacture of England to other countries’, was generally shared into the nineteenth century, as was his understanding that there were ‘several degrees of people employed in trade below [tradesmen], such as workmen, labourers and servants’. Traders and tradesmen and women thus appear in contemporary texts as a diverse, yet distinct social group: above unskilled workers, but below merchants and those in the professions. By the early nineteenth century, and into the twentieth century, the emergence of the term ‘in trade’ underlined this distinction between those of higher ranks, and specifically precluded the possibility of traders being considered genteel, whatever their wealth. The lack of attention paid to tradesmen and women in the past can be explained, at least in part, by their tendency not to leave a particularly significant mark on the historical record. Sometimes the glimpses found in the archive are frustratingly brief. This portrait of Nathan Wood, pattern and heel maker, inside his house, is a good example. Here Wood has been drawn by his friend and neighbour, the saddler, Thomas Barritt, sometime in the opening decade of the nineteenth century. We see Wood sitting proudly (if rather awkwardly, given Barritt’s limited drawing skills) in his workshop at the front of his house on Hanging Bridge in Manchester, facing the Collegiate Church, which is visible through the window. Chetham’s Library, Manchester Scrapbook, fo. 4. Although the image is suggestive of industry, and possibly also of the sitter’s Anglican piety, it is limited in terms of what it tells us about Wood and his life. Was he successful in business? How did he view his position in the commercial and social milieux of early nineteenth-century Manchester, and how did others see him? Who else lived and worked with him? How did household and familial relations function? What was the rest of his house like, and how was living and working space organised? These things we do not know, for there seem to be few other surviving records of Wood’s life, save for his listing in trade directories over a thirty-year period. But though we know little about Nathan Wood’s particular experiences, I am attempting at least a partial reconstruction of the world in which he lived by piecing together evidence from a diverse set of sources, including court records, wills and inventories, paintings, maps, newspapers, business records, correspondence, diaries and memoirs. Individuals such as Nathan Wood remain almost stubbornly absent from historical studies of the late eighteenth and early nineteenth centuries. Though it has been almost forty years since Geoffrey Crossick first urged historians to examine the English lower middle class,[iii] the response since then has been somewhat muted. They have not been entirely overlooked, and a steady trickle of scholarship has appeared during the last three decades which has revealed much about aspects of lower middle-class life as diverse as occupation, status anxiety, religious and political affiliations and community relations, but such work has focused on the late nineteenth and early twentieth centuries in large part. Moreover, it does not match the outpouring of recent work on more upper middle- and working-class family and gender relations and on identities. The failure of shopkeepers and small-scale manufacturers to excite subsequent scholars more interested in those obvious motors of social and economic change – the working classes and the wealthier middle classes – has not gone unnoticed. Neil McKendrick asked several decades ago why fellow historians have been so eager to explore the industrial revolution but not the consumer revolution, and in the process had ignored the bulk of people in trade. ‘Some discussion is required’ he asserted, ‘of why attention has centred on the great industrialists and the supply side of the supply-demand equation, and why so little attention has been given to those hordes of little men who helped to boost the demand side and who succeeded in exciting new wants, in making available new goods, and in satisfying a new consumer market of unprecedented size and buying power’. [iv] Of course I would contend that we need to pay attention to the hordes of ‘little women’ involved in this process too. Though a lack of historical source material can go some way to explaining why those in trade have tended to be overlooked by historians, other factors might also have come into play. When Virginia Woolf railed against the systematic privileging of masculine interests over feminine ones in A Room of One’s Own in 1945 she famously complained: ‘This is an important book, the critic assumes, because it deals with war. This is an insignificant book because it deals with the feelings of women in a drawing-room. A scene in a battle-field is more important than a scene in a shop – everywhere and much more subtly the difference of value persists’. Woolf was writing about the literary profession, and the ways in which women’s fiction was systematically undermined and ignored, but her remark that a scene in a shop is generally seen to be less important than one on a battlefield is clearly pertinent when exploring the lives of tradesmen and women, in which much of the action takes place in, or adjacent to, the shop and the workshop. As Arno Mayer implied, there may be a lingering ‘cultural cringe’ about those in trade. [v] Indeed, Virginia Woolf herself can be placed amongst those members of the early twentieth-century literary intelligensia who displayed what John Carey has described as an ‘anti-democratic animus’ which held members of the lower middle class in particular disdain. [vi] This suggests that it is not just the working classes who need rescuing from what Edward Thompson described as the ‘enormous condescension of posterity’. [vii] Moreover, though traders can be seen to have had a significant impact on the social and economic developments of early industrial revolution England, it is also the ‘ordinariness’ and the smaller-than-life adventures that individuals experienced that make them important to historians, for in order to truly understand the past we need to know not just about the exceptional and the heroic, but also the everyday and the commonplace. As men and women of largely humble means and often limited ambitions, it is perhaps not hard to see why they have failed to capture historians’ attention. Yet without them, the urban landscape in Britain during the late eighteenth and early nineteenth centuries would have been completely different – and the very transformations in economy and society that we associate with this period would have been profoundly affected as a result. This means that to fully understand the period, in addition to exploring the lives of the Wedgwoods and the Boultons, we also need to know about the experiences and the aspirations of individuals such Nathan Wood. [i] Maxine Berg, ‘Small producer capitalism in eighteenth-century England’, Business History, (1993). [ii] Daniel Defoe, The Complete English Tradesman (1726). [iii] Geoffrey Crossick, ed., The Lower Middle Class in Britain: 1870-1914 (1977). [iv] Neil McKendrick, ‘Introduction’, in Neil McKendrick, John Brewer and J.H. Plumb, The Birth of a Consumer Society: The Commercialization of Eighteenth-Century England (London, 1983). [v] Arno Mayer, ‘The lower middle class as a historical problem’, Journal of Modern History, 47, 3 (1975). [vi] John Carey, The Intellectuals and the Masses: Pride and Prejudice among the Literary Intelligensia, 1880-1939 (London, 1992). [vii] E.P. Thompson, The Making of the English Working Class (London, 1963). Image: John Ralston, Views of the Ancient Buildings in Manchester (Manchester, 1823-5), plate 4: Chetham’s Library. This post was also published on the FindMyPast website as ‘Life above the shop: A behind-the-scenes glimpse of a tradesman’s world’. Many family historians will discover ancestors who were ‘in trade’. The small businesses that tradesmen and women ran were at the heart of urban economic growth and social transformation in eighteenth- and nineteenth-century Britain, where shops and workshops dominated town streets and helped to satisfy an increasing desire for consumer goods. 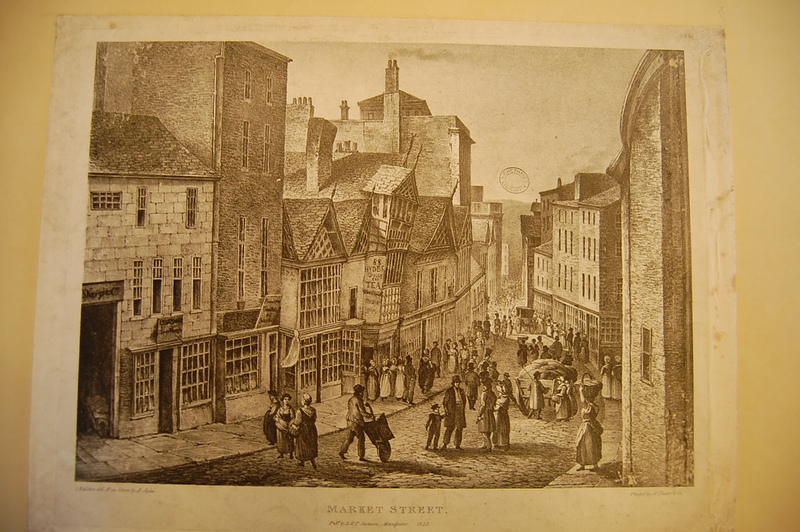 This view from 1821 of one of Manchester’s main thoroughfares, Market Street, shows the timber-framed structure of William Hyde’s grocery shop, at the centre of the picture on the left, with its porch leaning at a rather drunken angle. Next to Hyde’s shop (moving towards the foreground) was the cheesemonger and provision dealer Charles Pollitt’s premises, in another timbered building. In the more modern four-story brick building adjacent to that, John Hemingway, silversmith and watchmaker operated. On the other side of Hyde’s shop and adjacent to it was Mary Walker’s ironmongers, and next to her, Catherine Crossley’s toy warehouse, the premises of John Wickstead, umbrella maker and the Red Lion public house. Across the street were shops variously run by a druggist, a boot and shoemaker, a hosier, a linendraper, another cheesemonger, a straw hat maker, a cutler and surgeon’s instrument maker, a milliner and a tea dealer. Today shop-workers commute into town centres to sell goods produced elsewhere. But in the past these buildings were generally inhabited day and night, by individuals who both lived and worked in them, and who were often involved in both the manufacture and the sale of the goods that they stocked. Not only was living in the same building in which one worked common, but so too was co-habiting with employers, servants, apprentices, business partners, one’s own blood relatives and those of one’s employer. As one might expect, living and working cheek by jowl in this manner, often in very cramped circumstances, was not always easy. When George Heywood, a young journeyman grocer, moved into the shop and home of John and Elizabeth Jones on Hanging Ditch in Manchester as their employee in 1811, household relations were to prove tricky. A six room building, in which at least one room was given over to the business, had to accommodate Mr and Mrs Jones, a female servant, three adult male employees and the three daughters and one son of John and Elizabeth Jones, plus Mrs Jones’s two daughters from her first marriage, who were in their mid to late teens. This almost certainly meant that children and employees had to share rooms for sleeping, and probably beds too. Heywood does not seem to have understood a set of unwritten rules within the Jones’s packed household designed to uphold propriety. This resulted in an argument in which Mr Johns reprimanded him for sitting up late at night so that the women of the household couldn’t mend their clothes privately, washing in the kitchen when females were present and talking to a female servant in a bedroom on her own. Not surprisingly, Heywood soon left the Jones’s employ. Whilst he didn’t like his business partner with whom he subsequently lived and worked, he seems to have learned a lesson, and noted that ‘to be comfortable I must not dispute anything with him, but be silent where I cannot agree’. More on living above the shop here. If you are interested in information on individuals and families in trade in north-west England between 1760 and 1820, you can explore my project database. This has information on 2487 individuals and 806 businesses. Clothing the child workers: what did the Quarry Bank apprentices wear?